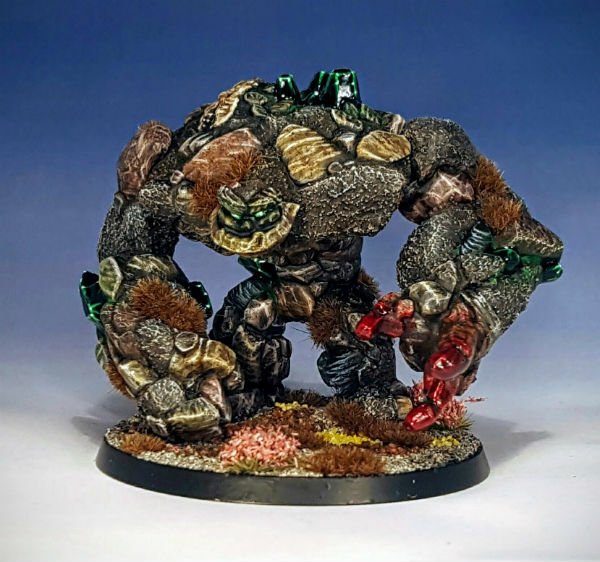 A recent trade with daggerandbrush got me this Reaper Bones Earth Elemental, so I painted it. 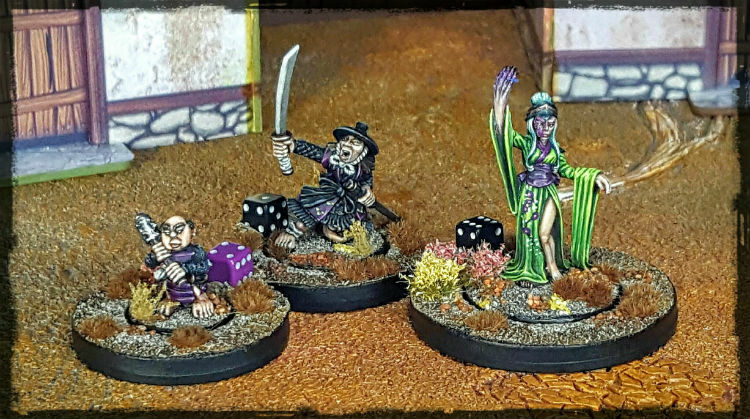 Once I started painting my Shonen Knives I was soon enjoying it enough to realise that I needed to get some similarly themed terrain. Kurîpu Jima became the plan. Mr Saturday and I have a weekend of hot, sweaty fimir on ninja action planned. I set up the table this evening and took a couple of snaps. 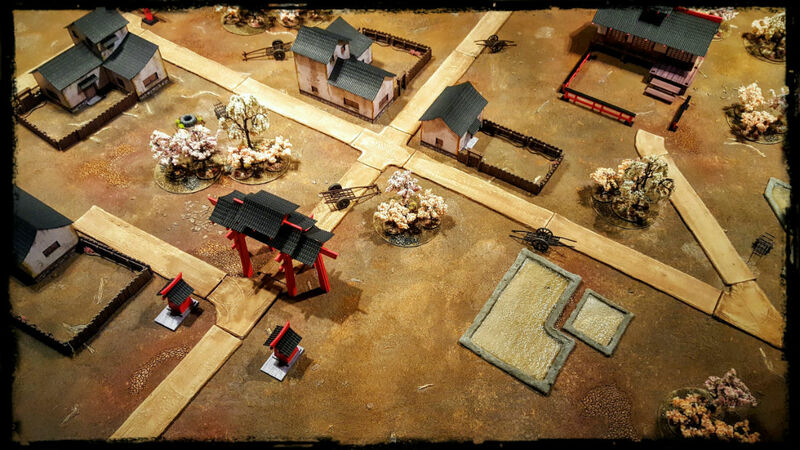 The terrain is from my expanding pseudo feudal Japanese set, planned to represent the Shonen Knives stomping grounds. I need a few more elements before I will be entirely happy with it, but considering that a couple of months ago it was nothing, Im still rather pleased. 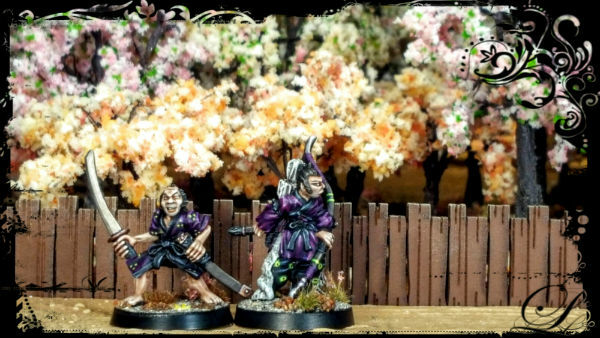 I plan to go into a bit more detail on the various elements at a later date, but for now I am pleased enough to stick up a couple of photos. 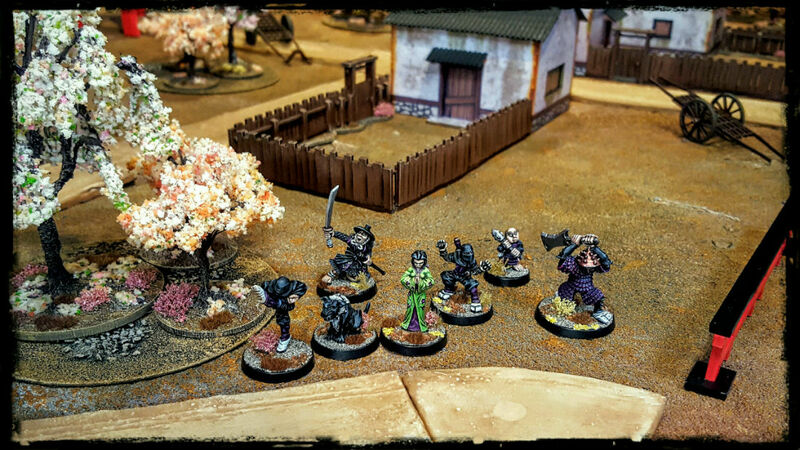 Im not sure that feudal Japan looked quite as suburban as that though. The fences dont look right and the paddy fields might not make sense their either. Guidance from those more knowledgeable than I am would be appreciated. “In Shogunate Japan taxes were paid in ‘Koku’ (the rice needed to feed one man for one year), and for this reason ‘Bei’ rice was grown in ‘Ta’ wet paddy fields all over Japan. During the shogunate period rice was grown in every ‘Mura’ (village), in open wet fields called ‘Ta’, though almost all the rice harvested went towards paying the village tax burden. For themselves villagers grew beans along the edges of the raised paths between their ‘Ta’ fields. They also grew fruit in their small fenced orchards, vegetables in their fenced gardens and other crops were grown in ‘Hatake’ (dry fields), often these dry fields were fenced. In their gardens villagers grew vegetables according to the region and season, fruit such as oranges, grapes, and cherry as well as plant materials like mulberry, tea and bamboo were grown in their orchards. Village gardens and orchards were fenced by ‘Mura Mokusei no Kade’ (village wooden walls). The dry crop fields were fenced with ‘Mokusei no Kade’ (wooden walls). In these dry fields wheat and millet were grown for their food, cotton and hemp were grown for weaving to make their common folk clothing; as any silk harvested by the villages was only worn by samurai families and the richest of ‘Chonin’ (Townsman).